Your jumping off point to the world of Gus Wilson, master mechanic, and his adventures as owner of the Model Garage. In some ways this is a snapshot of a natural mechanic before the days of trouble codes and printouts. A graphical navigator that shows which stories are available. Access the stories by clicking on either a month or a year. There is also a shortcut to take you directly to the cover art galleries and other places of interest. Links to galleries of the fantastic artwork that graced the covers of Popular Science Monthly. Accessible by links to the covers, listed by both decade and specific year. There are also links to information about some of the famous artists who created these masterpieces of illustration. 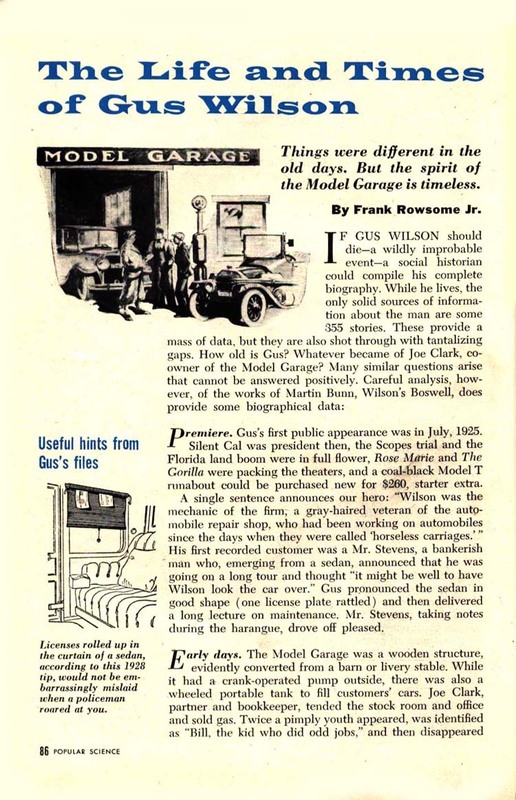 This page will take you to transcriptions of the Gus and the Model Garage series. Beginning in July of 1925 and ending in June of 1969 you can observe a "master mechanic" at work. He had an encore, one last Christmas present in the December 1970 issue. The elusive and mysterious Martin Bunn is discussed as well as some of the recurring characters of the series as well as Gus Wilson, proprietor of the Model Garage. Illustrator par excellence, Ray did the story illustrations from 1948 until 1970. My personal "hall of fame" dedicated to real-life "Gus Wilsons'" that have influenced me as a mechanic. There is also a gallery of service stations from the old days and even a photo of a shop bay that could've been graced by Gus. The monthly companion to the Gus chronicles. Here are a few examples of the ingenious solutions to some of the minor problems found while working on cars of the era. Just for fun, a narrative about the multi-volume set of books dedicated to "Things to Do and Build". First published in 1913 and into the 50's by Popular Mechanics Press. It's amazing we all survived. Links to other publications of auto interest on the site. This page gives a brief description of the character. As you read through the stories, though, he becomes more and more real.